Soooo excited to finally see a cover for this book! this book to see what is going to happen next..
November is not going to get here soon enough! Oh yes! I soooo cannot wait for this one either! The sequel to Pawn! That's a really great cover. I'll add it to my TBR. Great pick! I still haven't read Pawn, but I will definitely need to before this next book comes out. It sounds like a fantastic sequel! Haven't read the first book yet but this one looks good. I am looking forward to this one too! Great choice. Loved Pawn! Seriously can't wait to get my hands on this, and loving the cover! Great pick. I still have the first in this series lingering on my TBR pile. Ooh this is the first time I've seen the cover! Interesting. I liked the first book in this series so looking forward to finding out what happens next. I absolutely loved Pawn. I'm not the biggest dystopian fan, but I loved it. I love Aimee Carter's The Goddess Test trilogy so I was excited to read Pawn. 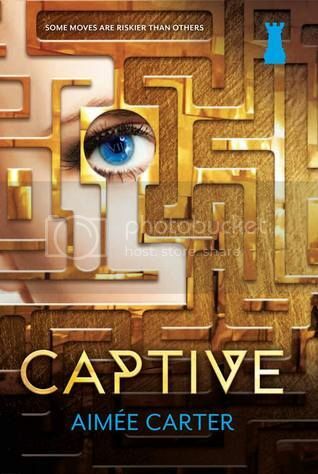 I can't wait until Captive comes out. I really want to continue with this trilogy.